"Using telling and beautiful imagery and astute commentary from many feminist leaders, the film persuasively argues that abuse of women and other oppressed groups goes hand in hand with abuse of the planet." 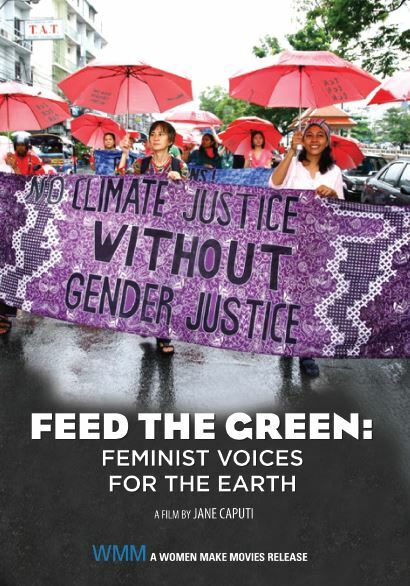 FEED THE GREEN: FEMINIST VOICES FOR THE EARTH challenges the cultural imagination surrounding the destruction of the environment. This enlightening documentary, by Women, Gender and Sexuality Studies professor and scholar Jane Caputi, features a variety of feminist thinkers whose voices are powerfully juxtaposed with images from popular culture, including advertising, myth, art, and the news, pointing to the ways that an environmentally destructive worldview is embedded in popular discourses, both contemporary and historical. Caputi also addresses the ways that the ill effects of environmental damage are felt disproportionately by those who face racial and socioeconomic inequalities. Required viewing for Women's and Environmental Studies as well as studies in Pop Culture. **Congratulations to Director Jane Caputi, WINNER of the Eminent Scholar Award at the Popular Culture Association/American Culture Association! Filmed over six years, BAY OF ALL SAINTS offers fresh insights into environmental justice and notions of home for citizens bypassed by Brazil's economic boom. The stories of three single mothers and their families shape this film's narrative as they confront uncertainty as the government's efforts to reclaim the occupied waters in the name of ecological restoration are impending. *Use offer code FEEDGRE16 to apply your discount. Cannot be combined with any other offer, other exceptions may apply. Offer expires May 15, 2016.